One of the top concerns many women have about breast augmentation involves how natural the breasts will look and feel after breast implants have been placed. 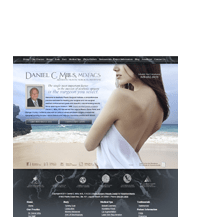 Dr. Daniel C. Mills is one of the few plastic surgeons in the U.S. who was part of an FDA clinical trial studying the new Cohesive Gel breast implant, commonly referred to as the “Gummy Bear” breast implant. After extensive study, the Natrelle® 410 Cohesive Gel breast implants are now approved by the U.S. Food and Drug Administration. What makes Gummy Bear implants unique is the greater cohesiveness of the silicone within them, making them able to create a more natural appearance and feel to the breasts after augmentation. Please contact Dr. Mills for more information on gummy bear implants. Since Gummy Bear breast implants have a more cohesive silicone inside their shells, they are better able to retain their shape. This improved reaction to pressure can reduce the risk of a rippling appearance. Plus, Gummy Bear implants may minimize other risks associated with traditional breast implants: clinical studies have shown a reduced risk of scar tissue formation around the implant leading to a feeling of hardness in the breasts (capsular contracture), as well as a lessened risk of implant leakage. Ultimately, Gummy Bear implants are designed to help you attain breast augmentation results that are firmer and that look and feel more natural. Like other types of breast implants, Gummy Bear implants come in an array of sizes and shapes to meet our patients’ unique needs. Our board-certified plastic surgeon, Dr. Daniel C. Mills, was part of a select group of surgeons chosen to participate in Gummy Bear breast implant clinical trials. Known as Natrelle® 410 Cohesive Gel Implants, Gummy Bear implants have been available in Europe for a number of years; however, they were not approved by the U.S. Food and Drug Administration for quite some time in order to study their effects. Recently, the FDA decided to issue approval of these implants, making the 410 Cohesive Gel options readily available in this country. At your initial breast augmentation consultation, Dr. Mills will be happy to talk with you about your options and determine if Cohesive Gel (Gummy Bear) breast implants are right for your needs. If you would like more information on Gummy Bear implants, or if you would like to schedule a consultation with Dr. Mills to discuss your options and your ultimate cosmetic enhancement goals, please contact the Aesthetic Plastic Surgical Institute.